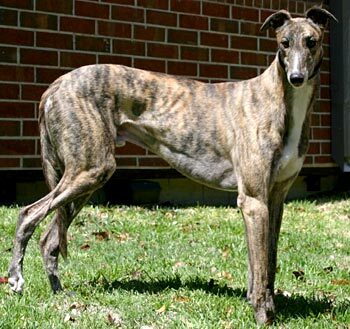 Maker, aka Career Maker, is a handsome, 2½-year-old brindle male born September 14, 2007. 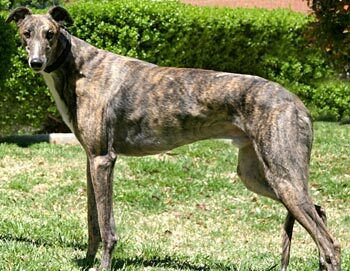 His sire is Dodgem By Design, making his grand sire the late, famous Gable Dodge, and his dam is Sheza Career Girl. 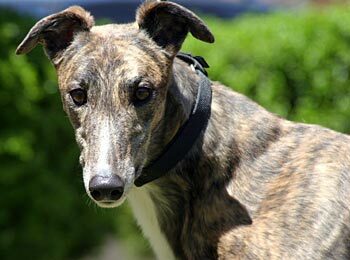 Maker’s racing career began on September 23, 2009, at Southland Greyhound Park in West Memphis, AR, moving and finishing on January 21, 2010, with a broken right hock at Gulf Greyhound Park in La Marque, Texas. Maker’s surgery was performed by Dr. Fulton Reaugh of the Dallas Veterinary Surgical Center, on February 4. Dr. Reaugh described the fracture as a clean break of the right central tarsal bone, which was repaired with two screws. Maker’s leg is now healed completely, and he is ready to find his forever home! There is a slight possibility that these two screws may have to be removed sometime in the future. Maker is cat tolerant. We will test him with small dogs at a later time. Maker has not caused one iota of trouble while at our house, despite having to be sequestered for approximately 8 weeks. He is SUCH a wonderful boy! He is, by far, one of the most laid-back fosters we've ever had. There's just not much that gets his goat. He does love his meals, but other than that it's Lounge City. Maker gets along fabulously with our pack of both greyhounds and mixed breeds. He hasn't been around small dogs to my knowledge, though. He loves to playbow when playing with our dogs, and he plays very well with others. He'll be ready to run around the backyard with the rest of them as soon as he can. Although his leg got a clean bill of health, he'll still need to take it easy for another month or so before he can be worked up to running around the backyard whenever he wants. If you're looking for an affectionate, sweet, laid-back boy to add to your home, Maker could be the one for you! He's got a lot of love to give, as evidenced by the kisses he loves to give us. He's such a deserving boy!